Bill and Ted's guitar strumming was good enough to create a utopia and play on Mars, but it's not enough for the Hollywood Bowl. But that's OK, because we'll settle for a third instalment of Bill and Ted's escapades, now confirmed as releasing in August 2020. While it was confirmed in May that the movie had entered pre-production, hearing it from Keanu Reeves and Alex Winters makes Bill & Ted 3: Face the Music seem so real. Before, we only dared to believe. 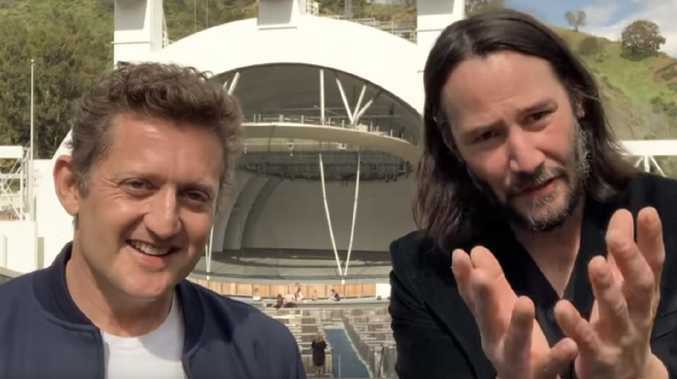 Reeves and Winter made the announcement in a short video filmed at the Hollywood Bowl, which has had more than 360,000 views so far - it's bodacious and fans are loving it. In the YouTube clip, the movie's star Winter said: "We're here to announce something." Reeves added: "Yes, we want to say thank you to you, the fans. Because it looks like we might..."
"Make a movie this summer!" Winter finished. In case you're wondering, their rhythm is still on point. For those young enough to remember it, Bill (Winters) and Ted (Reeves) went on an excellent adventure, travelling through time in a phone box with George Carlin (RIP) and passed their history class with help from Napoleon Bonaparte. Then they were replaced by killer robots, forcing them on a bogus journey to reclaim their lives, this time with the help of Death himself. Apparently they're supposed to save humanity through their band Wyld Stallyns - who, we've been promised, will get better. Maybe now is that time. Set decades after we last saw them, Bill and Ted are now middle-aged (they're definitely not getting carded anymore) and still looking to realise their rock 'n' roll dreams - maybe they didn't get to Mars after all. Once again, they'll be warned from the future that only they can bring harmony to the universe through their music, and they'll be helped along the way by old friends and new. Beloved by fans for its iconic lead characters - two seemingly dumb teen boy more interested in their band than their school work - the franchise has become a cult favourite over the past 30 years, and propelled the career of Reeves. Bill & Ted's Excellent Adventure, released in 1989, was followed by the sequel Bill & Ted's Bogus Journey in 1991. In between, there was two seasons of an animated series, and later a live-action TV series (starring different actors). 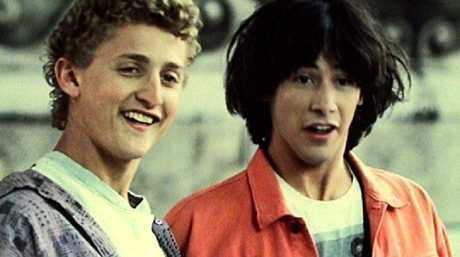 Bill & Ted 3: Face the Music has long been hinted at - Reeves mentioned a script was in production as early as 2010. Bill & Ted creators Chris Matheson and Ed Soloman have written the script while Dean Parisot (Galaxy Quest) is locked in as director.